Kids Are From Krypton, Parents Are From Pluto Radio Series update July 15, 2010: The key to playing with your kids is to provide toys and activities that meet their developmental level. Kids can play with the same toys for many months, playing with them in different ways as they reach new developmental stages. Some of the basic toys, such as blocks, serve so many developmental purpose that you don’t need to be quick to replace them and move on to something “newer.” For example, infants can begin to hold blocks and develop some muscle development and coordination. As kids grow, blocks help develop many other skills: object permanence (awareness that things exist even if you don’t see them,) building, planning, observing size/shape relationship, construction principles, strengthening fine and gross motor skills, using language, frustration tolerance, cooperation with others and use of imagination and creativity. Blocks are a great staple for ages 3 months on up. So are many other staples introduced at very early ages. The worst toys are those that do it all for the child–leave nothing left for the imagination (i.e.–one doll wets, another doll drinks from a bottle, and so on.) This stifles their creativity, spontaneity, experimentation and cognitive development. The most important part of playing with your kids is to have fun. Additionally, once you understand the concept of developmental tasks, you will delight in watching as your kids move from phase to phase, building on the skills mastered in the previous stages to move on to new and wondrous discoveries and experimentations in the next. Play with your kids from infancy all the way into adulthood. 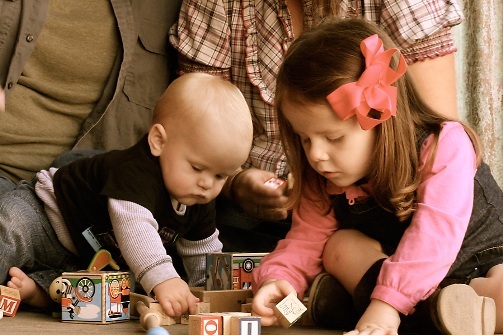 Keep the same toys around—kids will use the same toys in very different ways as they develop. Recognize that play is a very important activity for babies and toddlers to grow. Show your kids you love them…through your words and your actions.